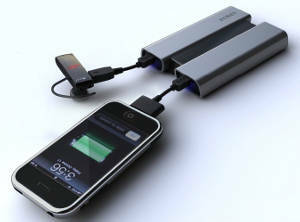 Callpod’s new Fueltank DUO can simultaneously charge two electronic devices without the use of an AC outlet. It has a built-in rechargeable lithium ion battery which has more than 7 times the capacity of a standard mobile phone (I’m still waiting to hear back about the exact mAh). The Fueltank utilizes device-specific adapters – the same ones used for Chargepod (1 free adapter voucher with each purchase). Proprietary voltage regulator technology senses the amount of power required to charge your devices and LED fuel capacity indicators how much juice is left. It will be available starting this weekend for $69.95 at Best Buy.